Last weekend, Baltimore Ravens Offensive Tackle Ronnie Stanley walked into local shelter BARCS with one goal in mind: "We are looking for a dog that's been here a long time and maybe not-so-adoptable." BARCS, an animal shelter and care center, posted on their Facebook page about the event. 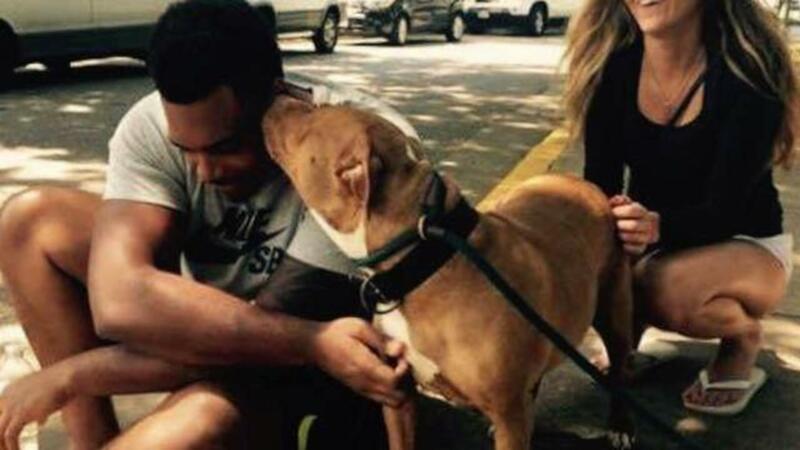 Stanley came to the shelter with his girlfriend, and teammate Alexander Lewis. According to BARCS, "not-so-adoptable" can mean traits like being old, having medical conditions, and "physically imperfect." Staff showed the trio of visitors a number of options and they decided on Winter, a six-year-old dog that has been in BARCS' care since mid-May. BARCS described the dog and her harsh life: "Beautiful Winter is a dog who has spent most of her six years of life falling into sad, unfortunate situations. She was found on a vacant property, on a hot day with no electricity, or open windows. She was dehydrated and extremely frightened. Winter has a long, hanging belly, mostly likely a result of over breeding--something we see far too often at our shelter. Due to her age, her belly is not something that will ever tighten up." The staff commented that these are things that usually deter those looking to adopt, but Ronnie is an exception. They wrote on their page, "Female dogs with such characteristics are often passed by in our shelter--but not by Ronnie!" When Ronnie saw Winter's condition, that did not stop him from falling in love with her. "Well, that's just what happens when you've had babies," he told BARCS volunteers. Ronnie then adopted Winter and she went home with her new family. BARCS spokesperson Bailey Deacon spoke about the adoption. "If big, strong, cool Ronnie chooses adoption, so will those who look up to him. And the bonus here is that he didn't come in and adopt just any dog, he specifically asked for a long-term, hard to adopt pup. How cool is that?"